The ability of geckos to climb almost any surface with ease has long fascinated humans. We combine studies of evolution, anatomy, biomechanics, and material science to reveal the mystery of how geckos perform these amazing feats. In the first study that showed the power of gecko toepads, Irschick et al. (1996) revealed that the two front feet could hold up to 20 N for a large tokay gecko, which is equivalent to a bag of 20 apples. This amazing force is produced purely by dry adhesion. The feet of geckos is complex, and they possess microscopic hairs (setae) that allow them, along with other structures in their feet to produce these dry adhesive forces. 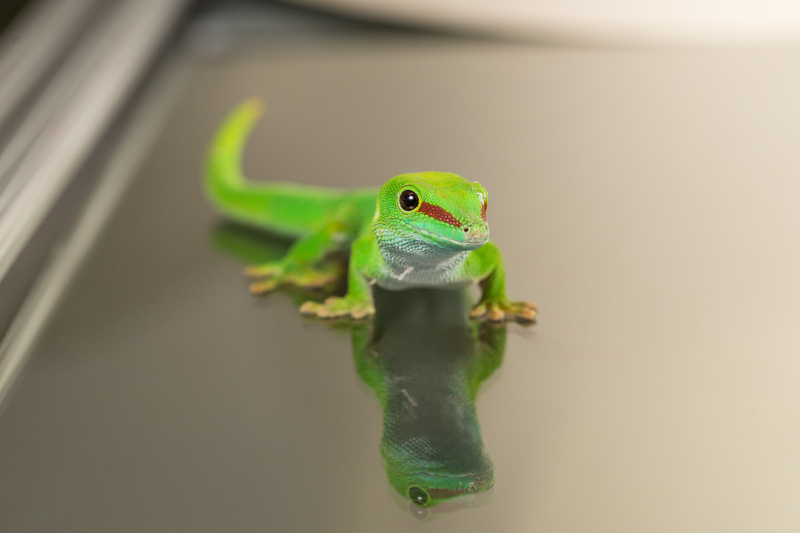 As an example of his work, Duncan Irschick has recently collaborated with Al Crosby from the Polymer Sciences Department at the University of Massachusetts Amherst to test and support evolutionary and anatomical principles behind the creation of a novel gecko-like adhesive. In February 2012, they, along with others in the Crosby lab, namely Ph.D students Mike Bartlett and Dan King, Postdoc Andrew Croll, and undergraduate Beth Paret, published a paper in the journal Advanced Materials that described Geckskin™, a synthetic adhesive that mimics gecko feet. Geckskin™ is capable of holding more than 700 lbs (300 kg) on smooth surfaces (e.g., glass), yet is easily removable, and leaves no residue. Geckskin™ has been hailed as a breakthrough because of its ability to provide powerful, removable and reusable adhesion at large sizes. Irschick DJ, Austin CC, Petren K, Fisher RN, Losos JB, Ellers O. 1996. A comparative analysis of clinging ability among pad-bearing lizards. Biological Journal of the Linnean Society. 59:21-35. Highlighted by "The Discovery Channel" for their Cable TV series Weird Connections in 2008. Irschick DJ, VanHooydonck B, Herrel A, Androsceu A. 2003. Effects of loading and size on maximum power output and kinematics in geckos. Journal of Experimental Biology. 206:3923-3934. Elstrott J, Irschick DJ. 2004. Evolutionary correlations among morphology, habitat use and clinging performance in Caribbean Anolis lizards. Biological Journal of the Linnean Society. 83:389-398. Irschick DJ, Herrel A, VanHooydonck B. 2006. Whole-organism studies of adhesion in pad-bearing lizards: Creative evolutionary solutions to functional problems. Journal of Comparative Physiology A. 192:1169-1177. Featured in The Daily Mail, Wired Magazine, SmartPlanet.com, The New Zealand Herald, New Scientist.com, NPR, Yahoo!, Voice of America, The Daily Planet, CNET.com, WTOP Radio, Daily KOS, Campbell Biology textbook, 10th Edition, and many other outlets. King DR, Bartlett MB, Gilman C, Irschick DJ, Crosby AJ. 2014. Creating gecko-like adhesives for "real-world" surfaces. Advanced Materials. 26:4345-4351. Featured in CNN, Gizmag, Discovery News, Geek.com, Nature World News, International Business News UK, and many other media outlets.